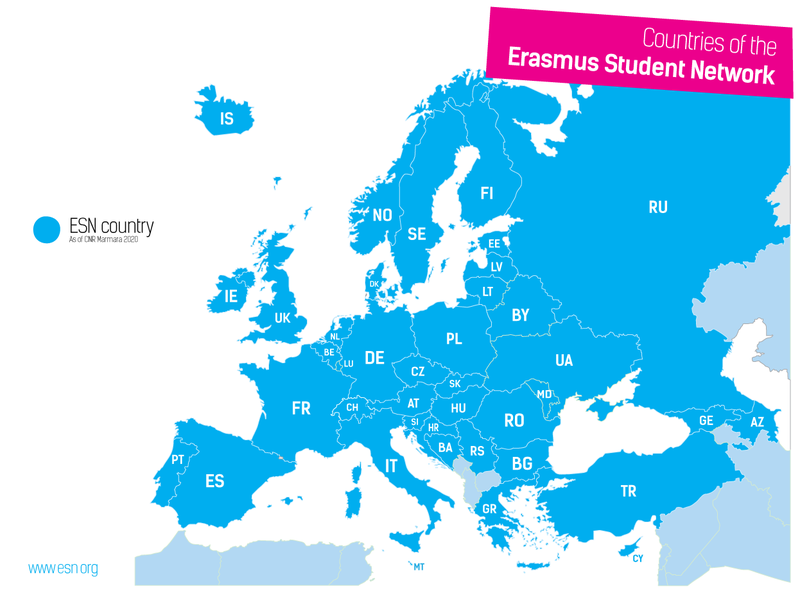 Erasmus Student Network (ESN) is the biggest student organisation in Europe, founded in 1989 with the aim of supporting and improving the student exchange. We are present in 900 Higher Education Institutions, 530 local organizations called ESN sections in 40 countries. The network is constantly increasing and expanding. We have around 15,000 active members that are in many sections supported by so called buddies mainly taking care of international students.Thus, ESN involves around 40,000 young people offering its services to around 220,000 international students every year. ESN operates on three different levels: local, national and international. The work of ESN focuses mostly on the creation of an environment based on an education always changing and flexible, sustaining and developing the exchange between students on different levels, offering the chance also to students who do not have the opportunity of living a period of time abroad, of experimenting an intercultural experience in their home city (“Internationalization at home”). The main focus of ESN is placed on current exchange students, who often face problems and feel abandoned in their new environments. ESN therefore offers help in the academic, social and practical integration process. This is mainly done through activities in the local sections, which include cultural and social events such as trips to various places within the country, film nights, language courses, buddy system, integration and welcome weeks, international dinners, spot events and much more. In addition to that, many ESN sections, sometimes in cooperation with their HEI, have introduced mentor systems to help and guide the international students mainly in their academic and practical integration. Students who return from an exchange period are invited to join ESN to ease their reintegration process by keeping contact with an international environment. Many local ESN sections are set up by former exchange students, often because they had good experiences during their exchange period or because they felt a lack of help during their own exchange. It is also true that these people understand the issues and challenges of a foreign environment. This makes them ideal to deal with these problems. Higher Education Institutions play a big role as with their support (and often “request”) students from different faculties come together and create a local section. To support internationalisation at home, ESN provides relevant information about study opportunities abroad to motivate prospective future exchange students. ESN also encourages future exchange students to gain international experience and relevant insights in different cultures before departure. The local section is a place where it is possible to meet students from other countries and cultures, speak other languages and breathe a bit of Europe at home for local students that do not have the possibility or the will to study abroad. Moreover, being active in a local ESN section helps developing soft skills, which are valuable for the future working environment. • works in the interest of international students. • works to improve the social and practical integration of international students. • represents the needs and rights of international students on the local, national and international level. • provides relevant information about mobility programmes. • motivates students to study abroad. • works with the reintegration of homecoming students. • contributes to the improvement and accessibility of student mobility.